Greetings - I am attaching three videos from this past August 14th. 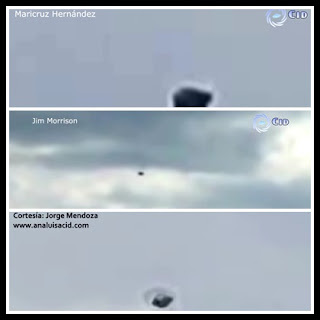 The witnesses have described a very large object floating over the México-Pachuca Highway. [They recorded it] using their cellphone cameras. Several drivers slowed down to witness the phenomenon. One possible explanation would be an enormous "globo de cantoya" (sky lantern), although the luminosity that appears to surround it is startling. Some have described a metallic dome. - Regards, Ana Luisa. Mexico: A UFO in San Baltazar Atlimeyaya? Diminutive UFO Occupants or Elementals? Peru: A Recent Airliner-UFO Near Miss? Mexico: Are UFOs Tampering with Volcanos?